It was Marathon Day in Boston ten years ago. A sharp wind was blowing off the harbor. The sun was pale, and the buds of the storm-bent dogwood in the yard were unconvincing. The calendar said Spring, but you needed a winter jacket. It was no weather for T-shirts and shorts, unless you planned to run 26 miles in them. Two young men carrying a six-pack apiece came down the street and ambled by my front window. They were wearing T-shirts and shorts, but they didn’t look much like marathoners. It made me shiver just to look at them. All the same, I was glad they’d apparently decided that the calendar was right, that this was in fact a Spring day, maybe even a beach day, all evidence to the contrary notwithstanding. They were onto something, I thought, going by the season, not the conditions, dressing according to things unfelt and unseen. It was a profession of faith. Jesus’ first disciples claimed, after his death, to have seen the Lord. We who have come after them have believed without seeing. 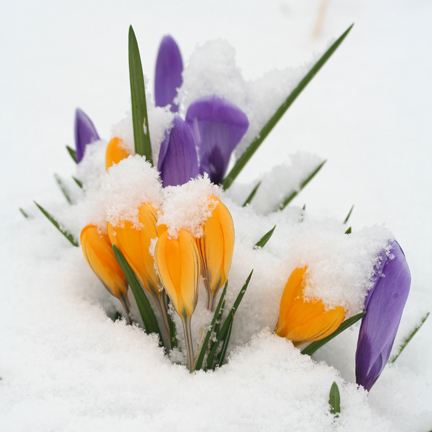 We have acted as if it were Spring, no matter the season. Generation after generation, we have worn light Alleluias in all kinds of weather. We have dressed according to the Word, not the conditions. Ever since faith graced us, it has been the church’s mission to go about in T-shirts and shorts in a world hunkered down for a frost that shows no sign of thawing; to put our faces into cold winds off the water as if they were zephyrs; to love the unconvincing buds as if each struggling sprout were a paradise. The world longs for an early, a later, and an everlasting Spring. God wants to give it such a season through the witness of our faith-filled lives. In a few short weeks it will be Easter. May the Spirit find us dressed for the occasion. This entry was posted in Marginal Notes on March 13, 2013 by sicutlocutusest.